Last week we have featured some amazing creative advertising ideas like UTEC’s water-generating billboard and our personal favorite is the awesome arcade game named Last Barfighter for Big Boss Brewing Company. For this week we are featuring some interesting advertisement like the making of crazy contraption just to take out the cream of a cookie. Qualcomm takes away the pain in waiting at bus stops with a crazy advertising stunt using simple poster, a URL and an array of quirky and cool ways of transportation. What is nice about the stunt is that it enforces the idea of being mobile and above all the idea of kicking the boredom away by just using the mobile phone. Some people like cream while some people don’t and that is what Oreo’s Cream vs. Cookie campaign is all about. This new TV spot features David Neevel a physicist and a copywriter who doesn’t likes the Oreo cream and he decided to build himself a machine that not only separates the Oreo cookie but also gets rid of the cream. 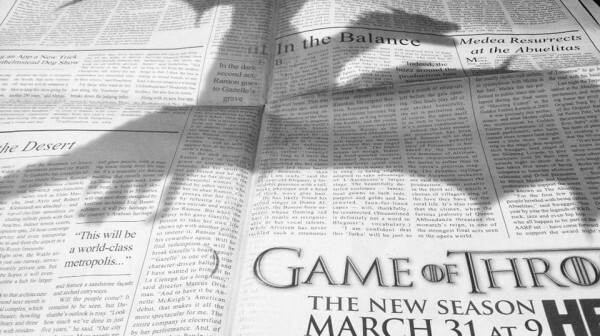 With season 3 being a month away HBO’s Game of Thrones invaded the Monday edition of the New York Times to remind everyone that the award winning show is going to be back on air. The amazing reminder comes in a bunch of fake articles and extremely convincing shadow of a dragon. Looks like Daenaerys is going to finally have a good season. If you haven’t seen the latest trailer yet better check it out now. Renowned car maker Audi showed that their latest creation is something that you’d wish to drive someday and they did that with a paintball duel. The duel is comprised of the latest Audi RS 4 Avant with a mounted paintball gun and driven by UK’s top stuntmen.